Over the years I’ve posted a number of times about my memories of Gordie Howe. Some of you who remember him as a player or may have met him will no doubt have reflections of your own to share. But to get the conversation started, I’ll jot down a few thoughts about Howe, who passed away Friday at the age of 88. I grew up in a very small town (outside of Windsor, Ontario), across from Detroit. So a lot of my early media and sporting influences—along with a lot of the music that I still love—stemmed from that experience. I saw, followed and read about the baseball Tigers, the football Lions and of course, the hockey Red Wings, though I did not cheer for any of the "local" teams. My Dad was a passionate Montreal Canadiens supporter. Rocket Richard and Butch Bouchard (and later Jean Beliveau) were his guys, Aurel Joliat and Howie Morenz before them. That meant the Red Wings, back in the 1950s and ‘60s, were the enemy. Both had superb teams in the ‘50s—Detroit won four Stanley Cups, Montreal won a handful as well. 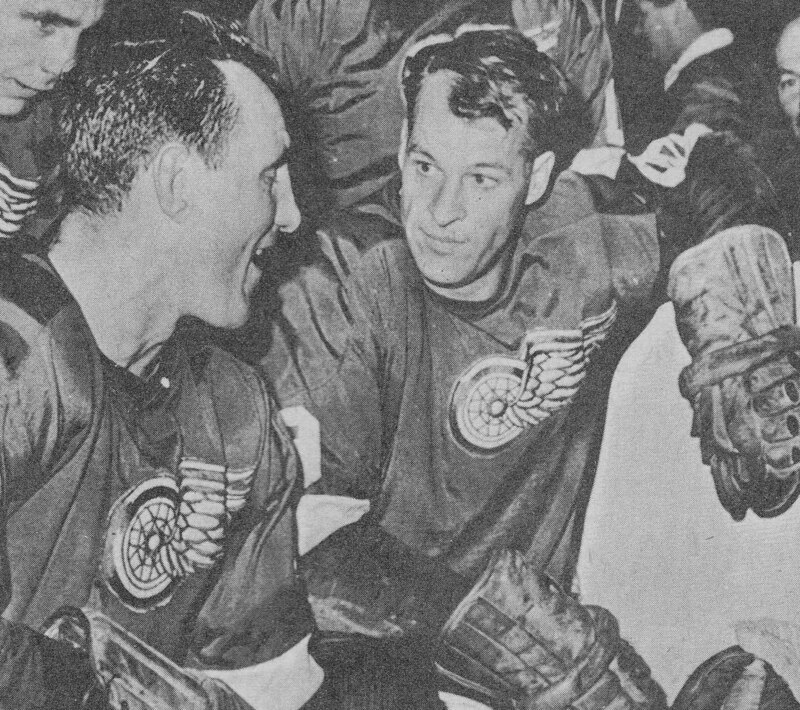 Those who were around at the time know all the great old names—Lindsay, Abel, Sawchuk, Goldham, Kelly and Pronovost with the Wings (and later Ullman, Delvecchio, Gadsby, etc.). 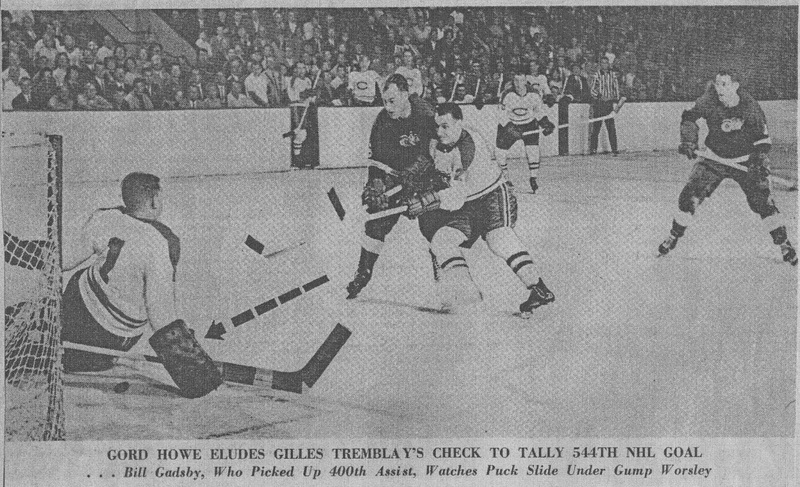 Olmstead, Moore, Harvey, Geoffrion, the “Pocket Rocket” and Plante were just some of the high profile stars back then with the Habs. My Dad developed an intense dislike for Gordie (hockey wise, not personally), though I know deep down he always admired the Red Wing standout. It’s just that people always compared Howe and Richard and the Rocket had, at the time, the NHL all-time regular-season scoring record of 544 goals. When Howe was approaching the record in the early 1960s, it was a bit of an uncomfortable time in our household. 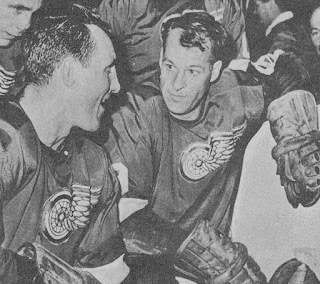 Of course Gordie went on to not only shatter Richard’s mark (he scored his 545th goal against Charlie Hodge and the Habs in Detroit, adding to Dad’s agitation; see the photo at left of Howe and Bill Gadsby, who assisted on the historic marker) but ended up with over 800 NHL goals. If we include what he accomplished in the WHA, he may still hold the record for most goals as a professional, though Wayne Gretzky surpassed Gordie’s NHL record. What do I remember most about Howe? Back when I was a passionate Leaf fan as a kid in the late ’50 and into the 1960s, he was one of the only guys who made me “scared” when he was on the ice. Whether I was watching a game n television involving the Leafs and Red Wings or listening on the radio (I listened to the local Detroit station most of the time with Budd Lynch and Bruce Martyn on WWJ, I think it was; on Sunday nights it was usually CBC radio) as soon as I knew Howe was on the ice, I was anxious. I knew what might happen—and it wasn’t good for Toronto. I also felt that way about Bobby Hull, the Blackhawk great, and later, Bobby Orr. But Howe was the first guy I hated seeing on the ice against the Leafs when I was a kid. He was a big player for his era (6 feet, 205 pounds), and while I rarely saw him fight (he had long before established his reputation as a fighter, so few challenged him by the time I saw him play a lot), he was nasty if angered. Most teams tried not to get him upset. He wasn’t the fastest guy on skates as the ‘60s wore on, but he always seemed to get to places—and open spaces—awfully quickly. He had remarkable on ice vision and as a result made passes few could make. As my father often noted (with frustration in his voice) few, if any, could receive a pass as well as Gordie, too. And of course, the guy could score—quite a lot. He did not have Hull’s cannon of a slapshot, but Howe somehow got the puck off really quickly, and likely had the strongest wrists in the game. 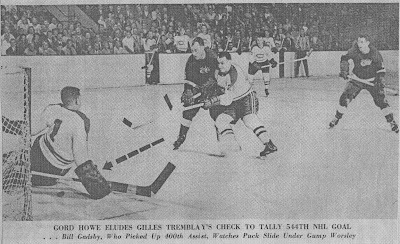 By the time I was watching him a lot in the ‘60s, he was not skating around guys as much as he was finding those open 'seams' (they didn’t call it that back then) in the slot and scoring from there, with center Alex Delvecchio and any number of wingers setting him up. But he also worked the corners himself and the front of the net. There wasn’t much he couldn’t do. In the 1964 finals against Toronto, Howe was really, really good. As I’ve posted here in the past, the Wings could have won that series. Because we lived so close to Detroit, the games were blacked out in our area. I of course listened to the games on the radio, but only in relatively recent times (Leafs TV, etc.) have I been able to appreciate the games in that series that were played in Detroit. Howe, while already somewhat in his late prime, was a stalwart in that series, a tremendous all-around threat. Maybe the nicest goal I ever saw Gordie score was on the second to last night of the 1969-’70 NHL season. The Red Wings were playing a rare Saturday night home game (rare in those days), hosting the Rangers. A win would secure their first playoff spot since 1966, when they had lost in the finals against Montreal. Howe took a pass near the side boards and broke in alone from the blueline. As he was cutting in front of Eddie Giacomin, he seemed to switch hands on the stick and beat the Ranger netminder with a deft move. The Wings went on to win the game and clinch a playoff berth. One time, my Dad ran into the Red Wings at the train station in Windsor. Dad was there to pick up my older brother returning home for a visit from university in the mid 1960s. Gordie was sitting alone, doing a crossword puzzle while waiting to board the train. Dad strode over and struck up a conversation and Gordie couldn't have been friendlier. I saw Gordie play a few times at the Olympia when I was a youngster, when Dad would bring me over to see the Habs or the Leafs play the Wings. I met him a couple of times, including when I interviewed him for an article I was writing maybe fifteen or so years ago when he was making an appearance north of Toronto at a collectibles store. My wife and I had a very nice chat with his wife, Colleen, and I was able to catch Gordie for a few minutes for a one-on-one interview. He was very gracious with his time. He was just a good, down-to-earth individual who happened to be a remarkable hockey player. By all accounts, he was just as good a person off the ice as he was a player on the ice. I don’t know who the greatest player of all time was/is. Bobby Orr was the “best”, to me—the most gifted guy I’ve seen on skates. But no one did everything Howe could do—skate, pass, take a pass, grind, hit, shoot (and score like he did), instill the fear of God and fight. We talk about 5-tool players in baseball. I don’t know how many tools Howe had, but he had every one you can imagine. And he did not need an enforcer to protect him. He handled that all by himself. His teams won championships. He won all kind of All Star nods and individual awards. He did all that for 25 years, took a couple of years off, then came back and played until he was in his early 50s. That’s why there will never be another Gordie Howe. We’ve lost some wonderful former NHL’ers in the last year, and a number of standout individuals in other sports, including Muhammad Ali. They all leave us with fond memories—and no small amount of inspiration. Thanks for a great write up on a great man. I'm too young to have seen Gordie Howe during his career, but he was certainly a great curiosity of mine when I began following hockey. We all grew up with these dreams of being in the NHL some day, and I had mine mapped out with a couple of specifics. Darryl Sittler was going to still be playing for the Leafs when I reached the NHL (he retired about ten years before I never made it of course), and I was going to play as long as Gordie Howe. I would have a couple kids who played alongside me like Mark and Marty. I always thought that was one of hockey's greatest stories, and what a dream it must have been for them all. It was hard to understand in my youth what impact he had on the game, or how he compared to the current greats. It was impossible to ignore this flashy kid in Edmonton putting up 200 points a year, and looking at Howe's career stats, it took me time to learn about the game to understand the different eras. Gretzky himself always acknowledged that in his famous humility. To hear Gordie Howe speak himself, you could see just how much Gretzky learned from him on how to conduct himself as a superstar. Simply put, there is no greater ambassador for the game of hockey than Gordie Howe. Simple boy from Saskatchewan who grew up so much different than today's kids playing hockey. I remember reading how he arrived at his first pro camp not even knowing how to put on his equipment properly, and he was laughed out of the room and sent back home. Off the ice, you never heard a negative story about him, in fact his devotion to his family is renown. Of course his toughness was never questioned, or if it ever was challenged, like Lou Fontinato once did, he truly learned the hard way not to expose Gordie Howe's wrath. As I write this, I am 44 years old. I had to stop playing hockey a couple years ago because my back has been acting up too much. I even have to take it easy on the ice when I'm coaching. Now I realize just how remarkable that this man survived 80 games in the NHL eight years older than I am now. If you didn't know a thing about Gordie Howe and you were told his life story, you might swear it was fiction. A truly remarkable life. A little aside, I did a bit of research. Howe scored his 800th goal on February 29, 1980 vs Mike Liut, then of the St Louis Blues, in a 3-0 victory. Al Smith (a very interesting story unto himself) earned the shutout. Good of you to share your reflections on Howe today, Pete. You're so right- Howe was obviously an athletic marvel on many levels, but he also, as you mentioned in reference to Gretzky, had such an impact on the game and other players. A young player could not go wrong following Howe's example- let your actions do your talking, stay humble and respect fans off the ice. Howe did all of that, and more. Thanks as well for filling me in on Howe's 800th! Take care, Pete. Very nice article Michael. While I never met Mr. Hockey when I was a kid my Uncle, Metro Prystai, used to tell stories when we visited. Uncle Metro was good enough and lucky enough to play on the Wings in the 50's with Gordie and win a couple of cups. My dad always said that was one of the few times in my life I was ever quiet as I used to listen wide eyed. :) He told a mixed bag of stories, some good and some not so good, of people but Uncle Metro never had anything but good things to say about Gordie Howe. That always stuck with me through the years when you hear about how great a player and even better person he was. Wonderful article, Michael! I know exactly what you mean about fearing Howe's presence on the ice. As you say, he may not have been the fastest skater - but he always seemed to be able to pick his way through defenders or find that open spot. I recall a game the Wings were playing against the Rangers, back in 1959 or 60. The Rangers had a tough guy named Lou Fontinato, who was the most feared enforcer of his day and pretty good with his fists (and stick). He and Howe had had a running feud for many games, I think, and it eventually came to a head in a game in New York. I've forgotten what precipitated the fight, but Howe broke Fontinato's nose and dislocated his jaw with only a few punches. Fontinato never recovered his reputation as an enforcer. As a kid, seeing the feared Fontinato clobbered like that, I realized that not only was Howe a great scorer and playmaker - he could take care of himself. There are many saying Howe's nickname - Mr Hockey - is perfect. When I consider all the skills he had, I have to agree. I can't think of another player like him. I think you've expressed it very well, Gerund 'O- Howe seemed to do everything you would want a great player to be able to do- and he did it for more than 30 years as a professional. Thanks for posting, Gerund. Thanks for posting your reflections on (and interactions with) Gordie (whether vicariously or directly), Michael! It was a good read that I thoroughly enjoyed (not to mention the comments as well). I may have mentioned my only vicarious contact came through a lady (Molly Gilbeault - who ran a snack bar in the local Chinese Grocery) who had been Gordie's babysitter when she was 13. It's funny how you remember these points of contact (even with degree(s) of separation). I remember seeing Gordie play a few times in my earliest years and wondered at his comeback in the WHA. I thought it was amazing that he played with his sons in Houston with the Aeros (I think I still have a magazine cover/article with all 3 in a brilliant picture on the ice in their blue and white jerseys). By the time Gordie played with the Whalers in the NHL, I truly appreciated the ageless wonder and will always remember the ovation he got at the All Star game... we will all miss him.